Sky arrives at the clinic covered with fleas of all sizes. No one knows if little 11 lb. 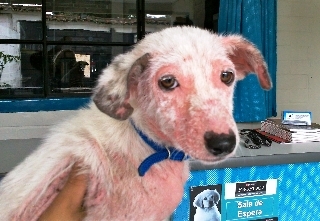 Sky, originally named Marshmallow would have lived or died that day in Jaibalito. Today, everyone agrees that she’s one very lucky puppy. When Ayuda volunteers first encountered Sky, she was being swept into a gutter while others threw stones at her. Dejected and weak, she didn’t even try to run. 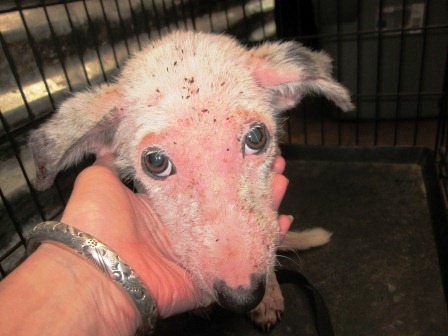 Poor girl was emaciated, full of fleas and demodectic mange, dehydrated with a belly load of parasites. Those on the scene were horrified at the sight they were witnessing and quickly snatched up Sky to see what could be done to help her. Far too depressed and ill for surgery, Sky needed foster care. On that particular day all the Ayuda foster homes were filled to the brim but we just couldn’t turn our backs on little Sky. Ayuda founder, Selaine picked up the phone and called good friend and long-time collabortor, Linda G. at Unidos Para Los Animales to ask for some help. It was agreed that Sky would ride back up to Antigua to spend some time in Dr. JP’s hospital while the rest of us looked for either a permanent or foster home. 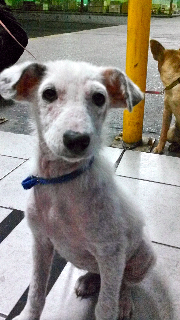 After 2 weeks of treatments, good food and some rest, her mange was dead, fur was beginning to grow back and she was ready for sterilization. All was going quite well thanks to a great team effort. The very best news for our sweet little Marshmallow Sky came this week when Dr. Jim Bader agreed to accept her at his shelter in Holland, Michigan. 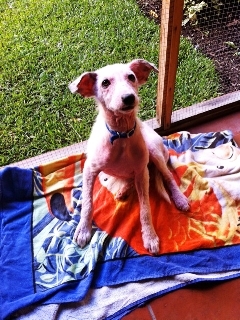 There she will complete her treatments as others help her find the perfect forever home! Enjoying her foster home in Antigua, GT. Previous postCanela Scores a Home!